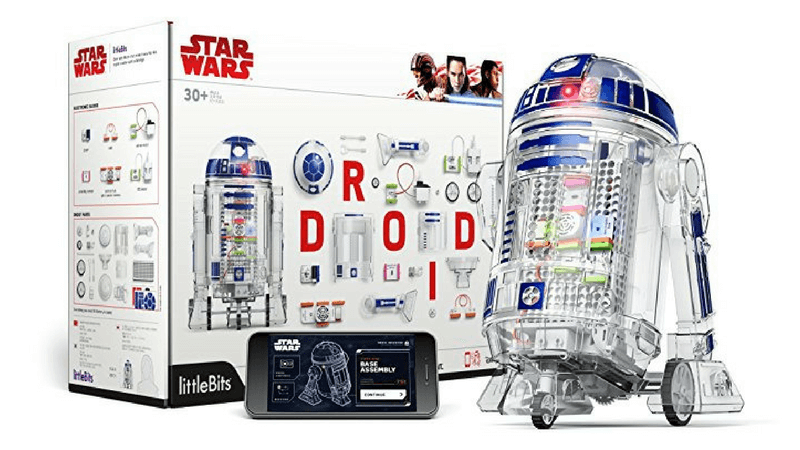 Editor’s Choice Awards — Our Favorite Gift Ideas for Kids! 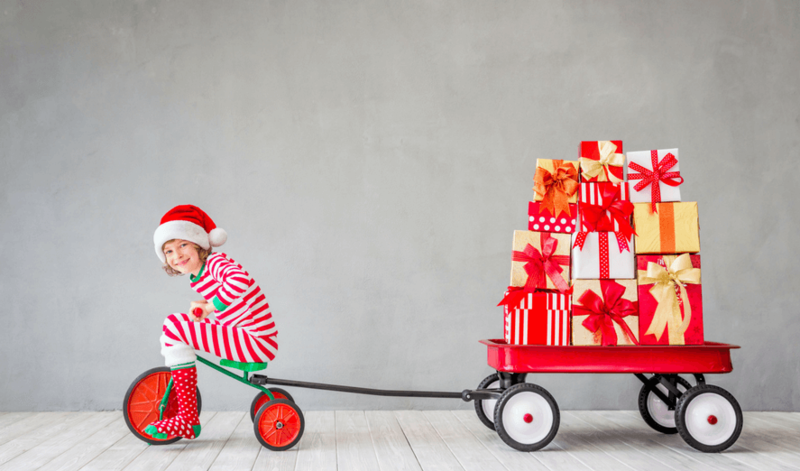 With hundreds of recommended gift ideas between our Toy Gift Guides and Non‐Toy Gift Guides, we fully recognize that you may not have the time (or frankly the energy) to plow through them all looking for just the right one. 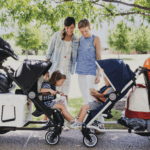 At What Moms Love, our mission is to provide content that can make your life easier, so with that said, we decided to pull together our Editor’s Choice list of foolproof gifts. All these gifts were featured in our individual guides, but because they are some of our absolute favorites, we wanted to highlight them even more. 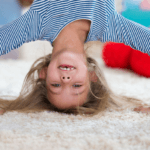 Select any from this list and your child is sure to fall madly and deeply in love. Note: post contains affiliate links. For more information, please see our disclosure policy. For us, this is a must‐have gift for any child 6 years and older who can express themselves through drawing and writing. 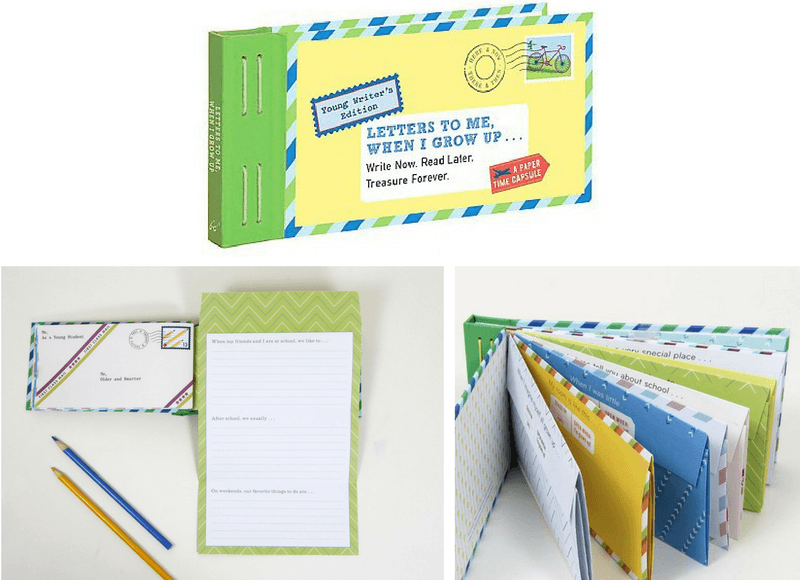 Letters To Me, When I Grow Up is a beautifully crafted book that includes 12 letters that they can write to their grown‐up self using prompts such as: “If I become a world leader…”, “My friends and I love to…”, and “When I imagine myself all grown‐up…”. They can seal up the letters with the included stickers, and store the book away for safe keeping. Years in the future they can open up their time capsule and marvel at how far they’ve come (and have a good laugh in the process!). What’s better than a good holiday book? Well, how about a good holiday book personalized with your child’s name?! 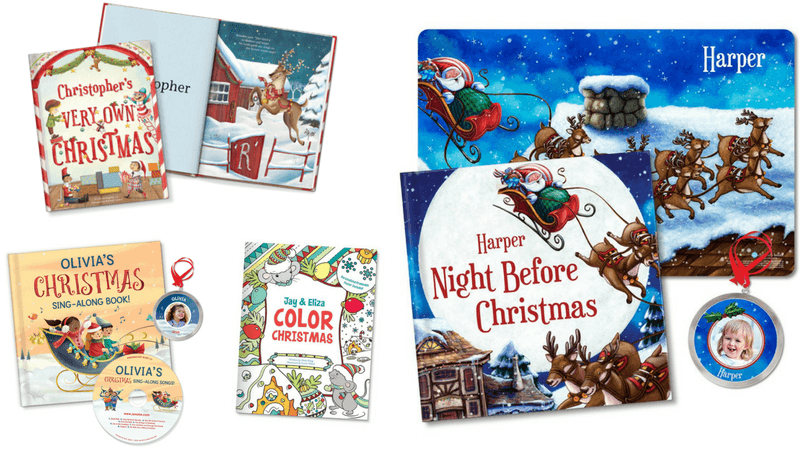 The high‐quality selection from iSeeMe will certainly capture your child’s attention once they see that the story includes their very own name, and these will be the ones they ask for over and over again…even after Santa’s come and gone. 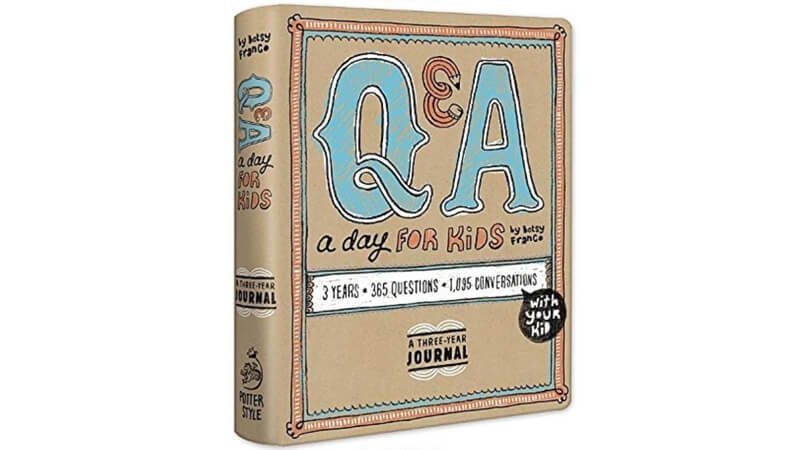 This super special journal includes daily questions to ask your child (or if they are old enough, to answer in writing themselves) every day for 3 years. There’s a short space to write down their response, and as the years pass, you will be able to see the evolution of their thoughts, hopes and dreams. The questions are geared towards kids aged 3–10 and vary from lighthearted (“If you could buy anything, what would you buy?” and “What is your favorite thing to do with friends?”), to a more reflective (“What have you done lately that you’re proud of?”, “Describe a time when you were mad” and “What would you like to do but can’t do yet?”). Kids find the questions engaging, and their answers can be a great springboard for conversation. 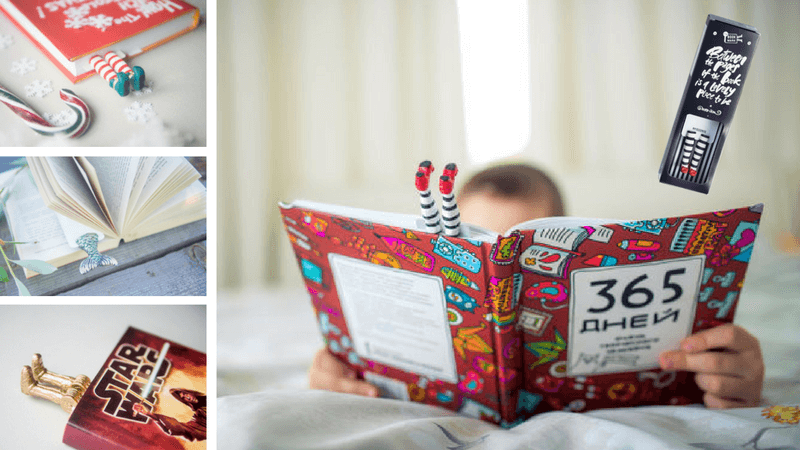 This journal a truly wonderful way for children to get to know themselves better, and they’ll end up with a neat time capsule as a result. 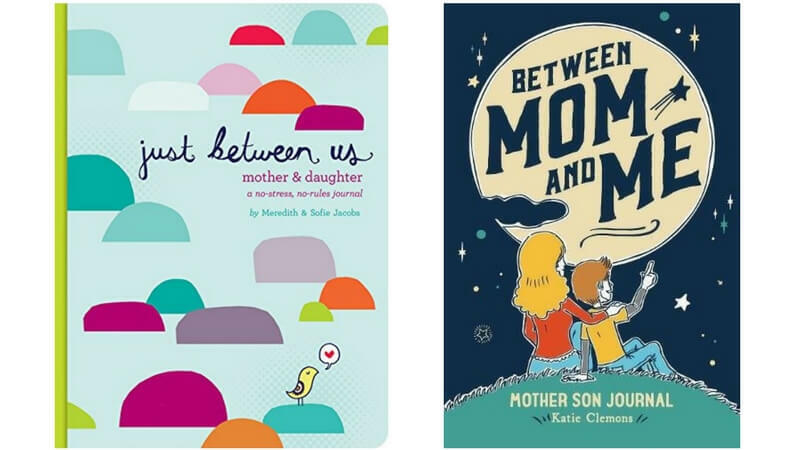 Just Between Us: Mother & Daughter: A No‐Stress, No‐Rules Journal is an amazing tool to use with your tween or teen daughter that gives them the opportunity to open up, write down any questions, or share thoughts that might otherwise be too embarrassing or difficult to share. There are thoughtful writing prompts (“Before I fall asleep, I think about…”, “My biggest regret..”, “Questions for you…”), mini quizzes and lots of free space for writing or drawing whatever is on your mind. The idea is to trade the journal back and forth so you each contribute and respond to each other in writing – you may be surprised at the emotions and honesty you receive in return, it can be truly powerful. It’s also a great way to approach tough conversations (writing first, then talking it through) and ultimately it can be saved as a beautiful keepsake. What kid doesn’t dream of a new bike with a big red bow on it?! It makes an extremely functional, yet exciting gift, that is sure to get lots and lots of use. And in this day and age of technology, it’s a sure‐fire way to get your child up and moving outside in the fresh air. Fist bump for that. Now we have one brand that we give our highest‐of‐high recommendation to: Guardian Kids Bikes. We’d heard about their innovative super‐safe SureStop brake system and had the opportunity to test them for ourselves. We were blown away. Not only are these bikes a breeze to assemble (they come 95–99% assembled based on which one you select), but the quality and craftsman are comparable to that of a high‐end adult bike. Back to that SureStop technology we mentioned — this braking system reduces stopping distance and helps prevent braking related accidents including head‐over handlebar falls (hurrah!) and front‐wheel skidding. There’s only one brake lever making it much easier for kids to control, and the system automatically distributes the right amount of braking power to both wheels for smooth and controlled stopping. These bikes are worth the investment for this braking technology alone. 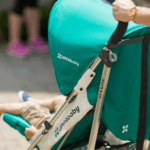 The website will easily help you calculate which size bike will be the best fit for your child: the 20” (available in single speed or 6‐speed) or the 24” (7‐speed). Both come in several different designs (editor’s note: my son exclaimed “that’s sick!” to the matte black with shiny colored decals …a good sign from a 7‐year old I suppose! ), are lightweight (about 10lbs lighter than the average kids bike), and include a sturdy kickstand. Overall we found that riders who were a bit timid on their big box store bikes quickly became much more confident on the Guardian Bikes thanks to the quick and easy stop, and their overall geometry (lowered frame and longer wheelbase) which is specially designed to help kids learn to ride more easily. 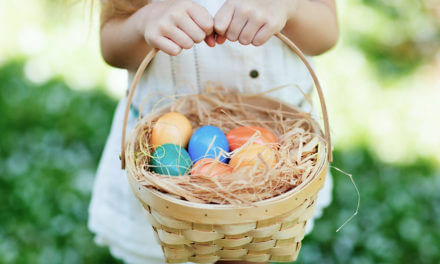 This is one investment you won’t regret…and that your kids will never forget! 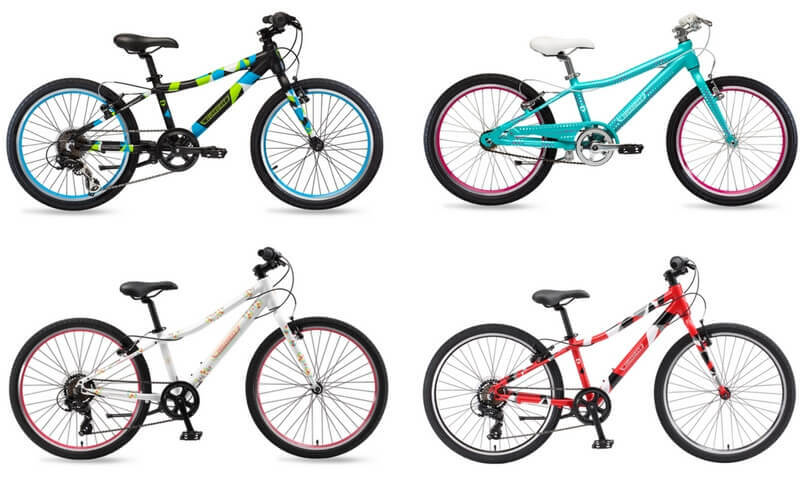 SPECIAL OFFER: Get $20 off every Guardian Bike using code: WHATMOMSLOVE at checkout. Ever pay an arm and a leg to rent a bouncy house for your child’s birthday party, or take them to a “fun zone” that lets them bounce around? Well imagine if you had your very own that you could inflate within minutes to use for parties, play dates or when the going gets rough. 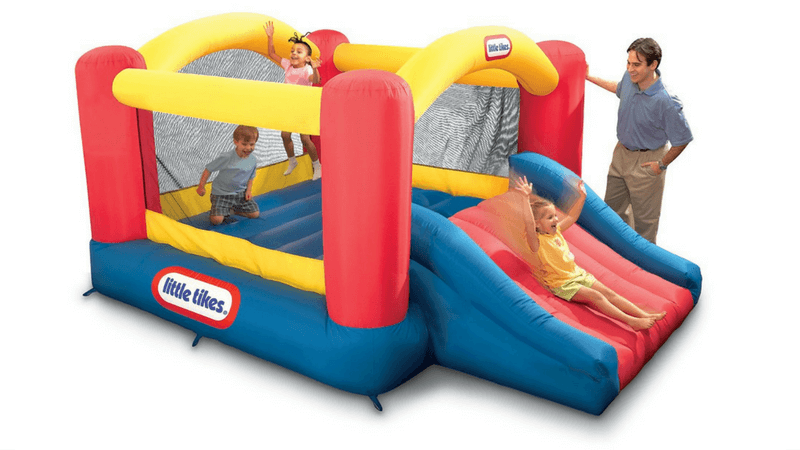 The Little Tikes Jump ‘n Slide Inflatable Bouncer is small enough to set‐up inside, but offers a large jumping area for multiple kids with tall walls, mesh netting, and a fun exit slide. It’s a worthy investment that will literally pay for itself. 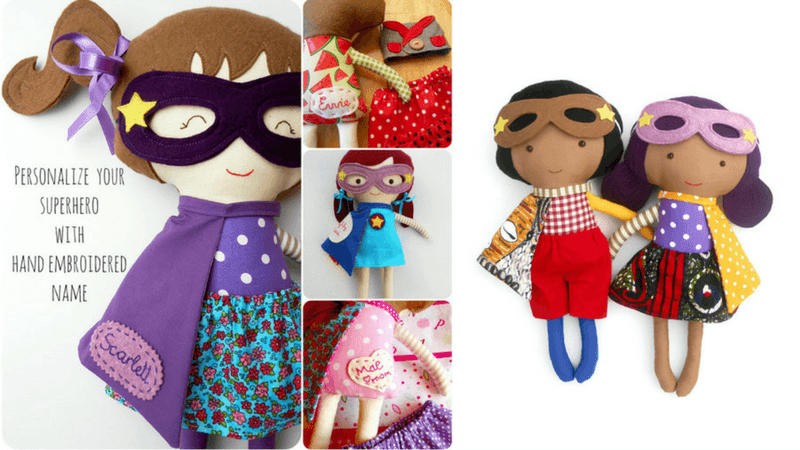 We love one‐of‐a‐kind, homemade toys so we got super excited over the incredible selection of peg people we found on Etsy’s Peg Buddies shop — including Super Heroes, Star Wars, Princesses, Descendants, and many many more! 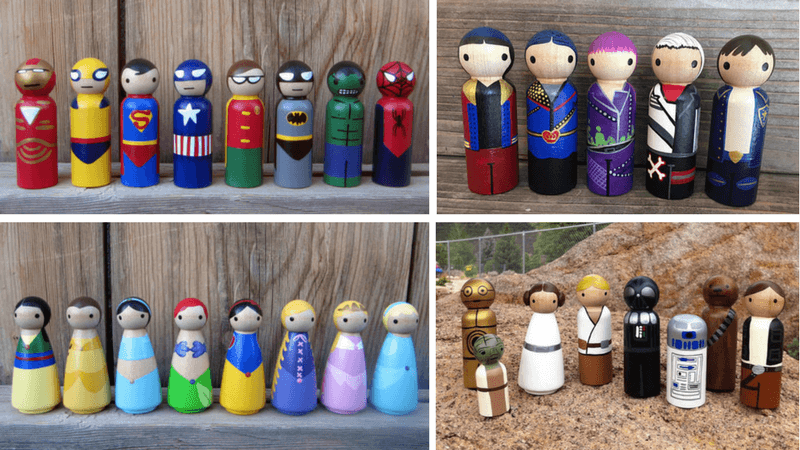 Their stunning peg dolls are entirely hand painted and sealed with non‐toxic acrylic paint. 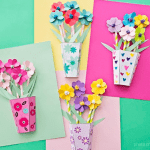 And since they are made‐to‐order, this truly is a one‐of‐a‐kind gift that surely will become keepsakes for your children to one day pass down. The pegs come in a fabric drawstring pouch, perfect for storage and travel. 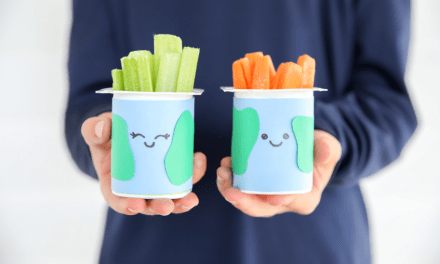 These solid tempura painting sticks are nothing short of genius – now your kids can paint without any set‐up or mess involved. 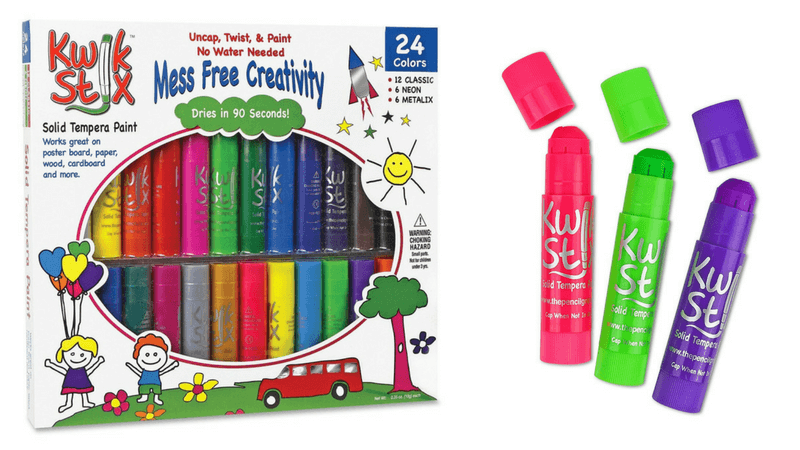 Just twist up the Stix and use it as your paintbrush – the colors come out bold and smooth and dry almost instantly. No more brushes to clean, and they can be used on paper, cardboard or even wood (although hopefully not on your furniture!). We tested a few spots on clothing and it washed right out. 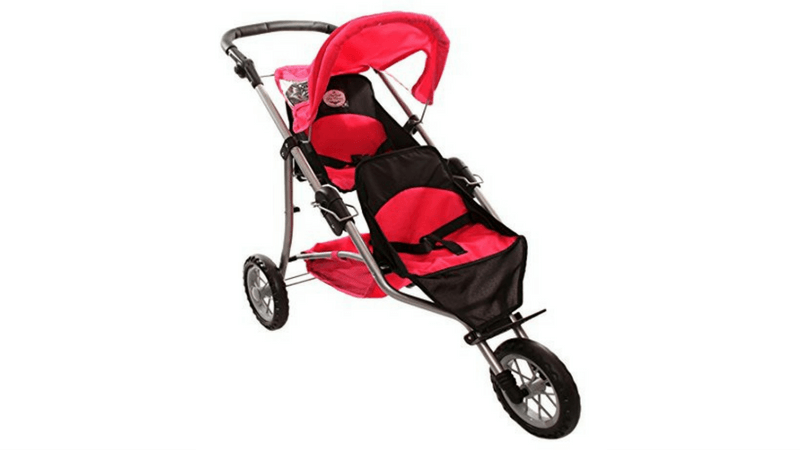 Check out the Thin version for older kids and the fun Metallic and Neon colors. Kids go crazy for these! 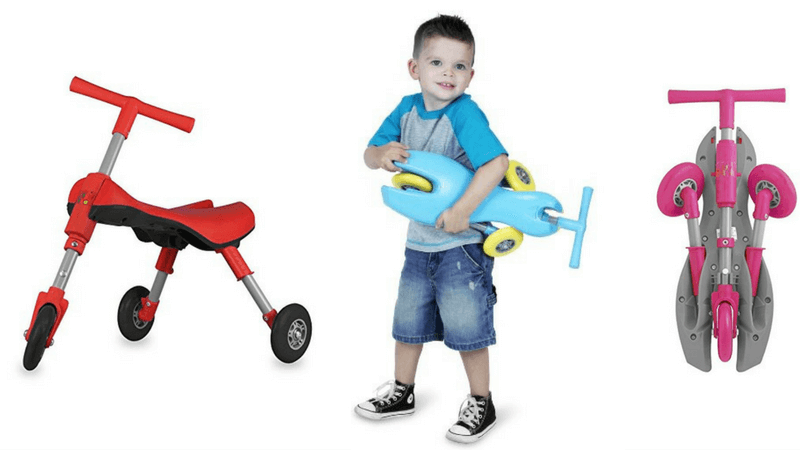 If your kids have never experienced the kid‐powered PlasmaCar, they are sure in for a treat. 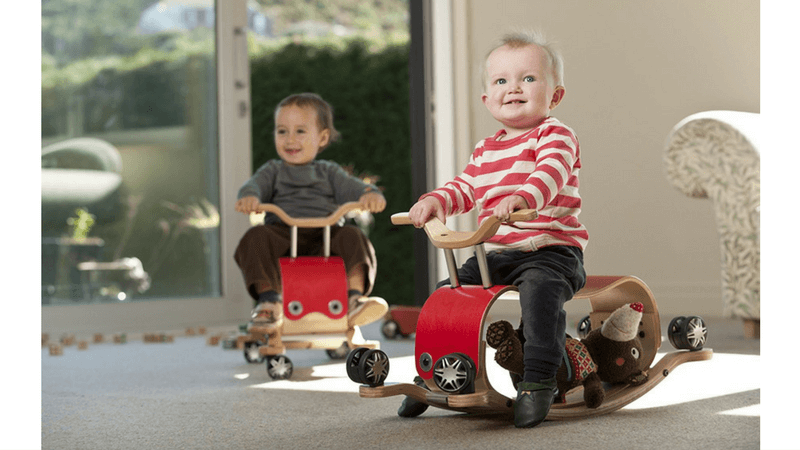 With no batteries or pedals they may wonder how to “drive” it, but with a few slight back‐and‐forth turns of the steering wheel, they’ll soon be moving along and feeling totally grown‐up. We’re not quite sure we understand how it all works (something to do with inertia, centrifugal force and friction we’re told), but all that matters to your child is that they have all the power to make this cool car go. 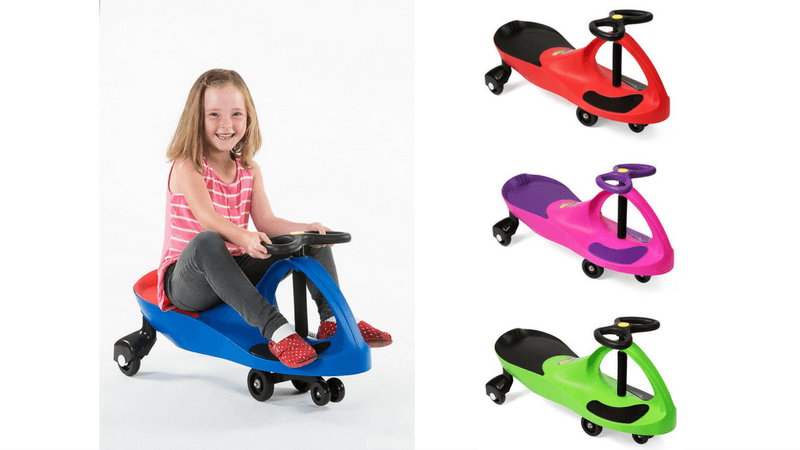 With tons of fun colors to choose from, and the ability to use it indoors or out, it’s no wonder it’s won every toy‐award under the sun (editor’s note: and don’t be shy about taking a seat and giving it a try…from, ahem, experience, it is a blast!). Magnetic Tiles are one of our favorite open‐ended building toys, and a highly‐recommended investment because they will get so much play time over the course of many, many years. These tiles easily connect thanks to integrated magnets on the edges of each piece, and can be used to make both 2D designs and 3D structures. The brand you’ve probably heard of is MagnaTile, but these tend to be extremely pricey and guess what – we’ve found another well‐respected brand that offers the exact same product, for a much more reasonable price. 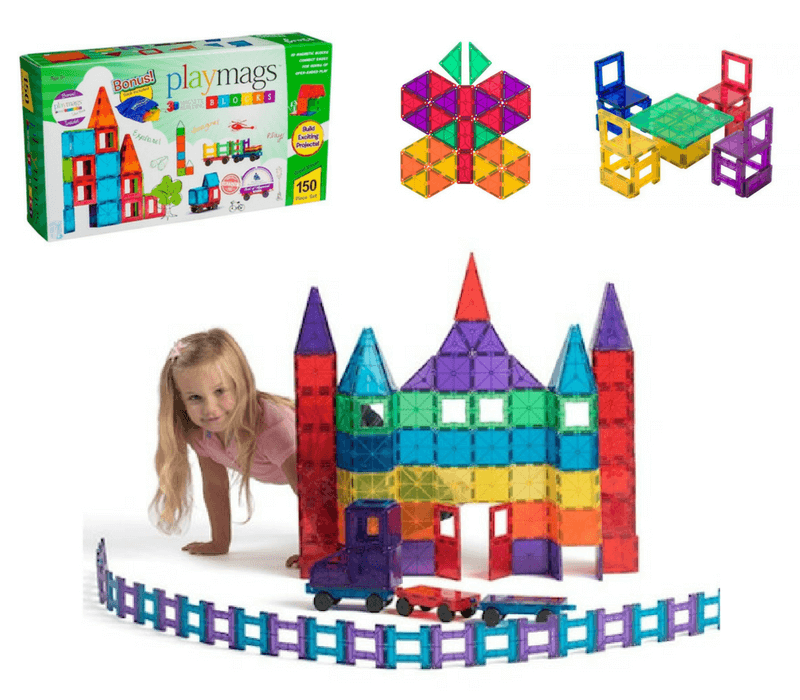 We tested the Playmags Magnetic Building Blocks alongside MagnaTiles and found them to be totally comparable – both have well‐constructed pieces to withstand heavy play (and tower tumbles! ), and can build a tower taller than your average 4 year old. The Playmags 100‐Piece Clear Colors is $50 cheaper, and comes with a car base (which our kids loooooved) and bonus storage bag. Even the 150‐Piece Set is $20 cheaper and comes with 2 car bases, fun fence and half‐sized pieces, and the storage bag. Kinda makes it a no brainer, right? Kids can build all kinds of fun stuff with these – we had a land of tiny Fairy houses, an enormous rocket ship, an animal hospital with different “patient” rooms and a Demolition Derby course built by various groups of kids over the course of an afternoon. The creativity that comes out of these blocks is incredible – prepare to be blown away by what your children create! If you were to ask us what our #1 toy recommendation would be for young children, this would be it. Every child should have a block set, and the 60‐Piece Standard Unit Blocks from Melissa & Doug is the best we’ve encountered for limitless imaginative play. These blocks are sanded smooth (no splinters or sharp edges), and are extremely hard‐wearing (editor’s note: we’ve had a set of these blocks for over 6 years and they still look new…and they get played with on a daily basis). They’re the perfect size for young builders to stack, balance and create. One day these blocks were made into a gymnastics obstacle course for dolls, the next they were part of a construction site, and another they formed animal cages at a Zoo – they are easy to incorporate into almost any aspect of your child’s play. And they come in an indestructible wooden storage box that not only serves as a place to pack them away at the end of the day, but can also be incorporated into their building. A must, must, must buy! Yes, Lego, yes! 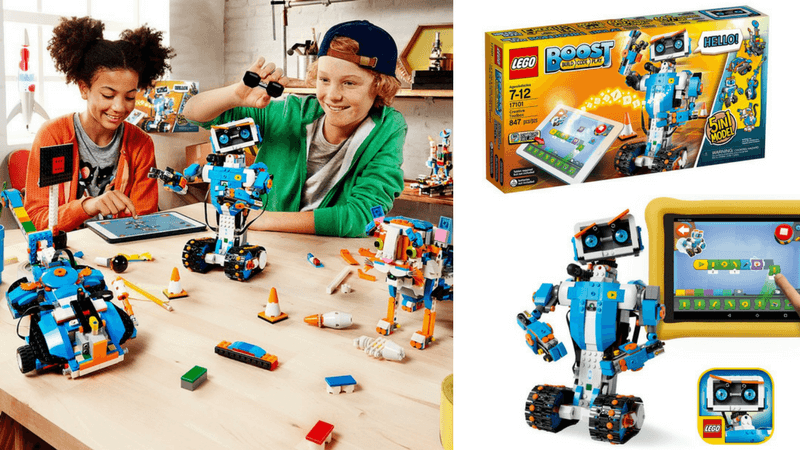 They completely hit it out of the park with the launch of the new LEGO Boost Creative Toolbox building and coding kit – so much so that it’s on our must‐have list for the holidays. It combines the Lego building we know and love, with robotics and programming – but in a way that is fun and feasible for younger builders. Pretty incredible, right? You can build 5 completely different models from this one set: Vernie the Robot, a cool Rover (which includes the popular spring‐loaded shooter! ), a Guitar, the interactive pet Frankie the Cat (our personal favorite) or the Auto Builder (which builds mini Lego models!). You can then bring these creations to life using the free app’s easy‐to‐learn coding blocks. Because it is a 5‐in‐1 build with all the additional code and play features, this one toy got hours upon hours of play time with our testers. And at $159.99, it’s an incredible price for a LEGO set which has so much functionality and brains to boot! 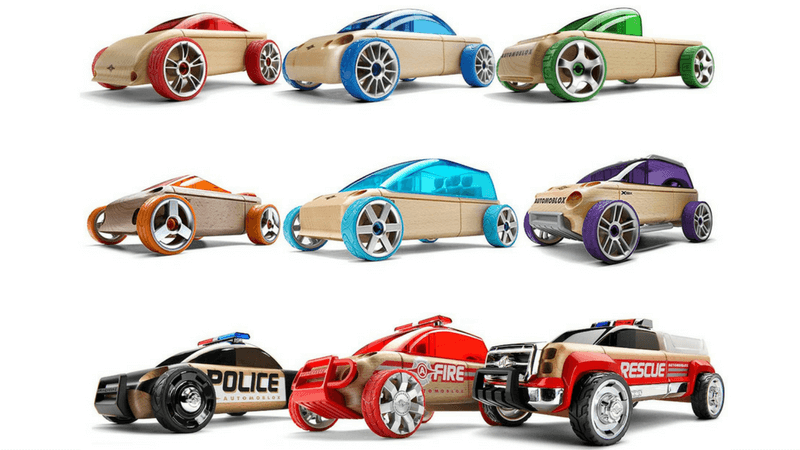 Ok, we are just completely enamored by these Automoblox Minis (and we know your child will be too). They are incredible mix‐and‐match cars made of beautiful German beech wood that can be taken apart and easily snapped back together in countless different ways, thanks to the interchangeable parts. We tested various 3‐packs and the kids had an absolute field day swapping out the wheels, roofs, and front and back ends to create unique vehicles all their own. And once they were done building, the real rubber tires allowed them to race really fast! We highly suggest either the S9/C9/T9 3‐Pack or A9/X9/M9 3‐Pack sets (pick the one with your child’s favorite colors), and the must‐must‐must is the Mini Emergency Playset which adds parts for Police, Fire and Rescue vehicles into the mix. You can’t beat Bruder trucks in realism and function for this age range. You just can’t. 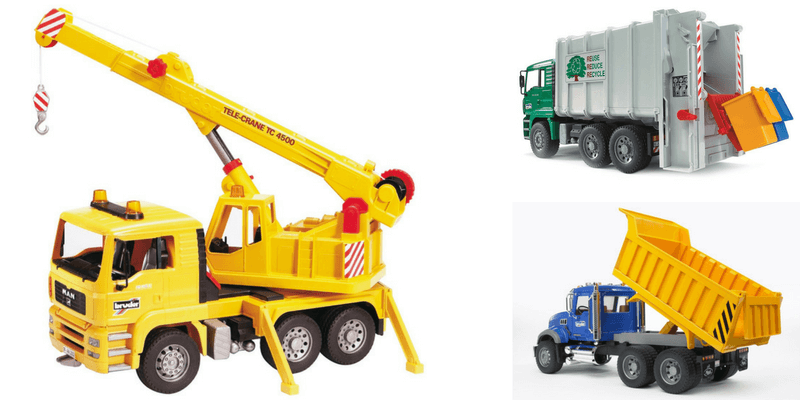 These trucks are the mack daddy of them all, and at several feet long, kids can really examine the features and learn more about how the real ones operate. The Bruder MAN Crane Truck definitely got top ranking, with the swiveling crane that can be extended high into the sky, stabilizing legs, and a steel hook that can be attached to your chosen item (we had stuffed animals, smaller cars, baby toys and more going for a ride!). Other tried and true favorites: The Bruder Loader Backhoe and Bruder Mack Granite Dump Truck (both are awesome for big sand boxes and outdoor play in the dirt!). We suggest everyone has an Eye Found It! game in their rainy day arsenal. These cooperative games are incredibly engaging and will entertain your kids (and yourself if you so choose!) until the sun comes out. We have 2 particular favorites in the series, Richard Scarry’s Busytown (3+ years; 2–4 players) and World of Disney (4+ years; 1–6 players). 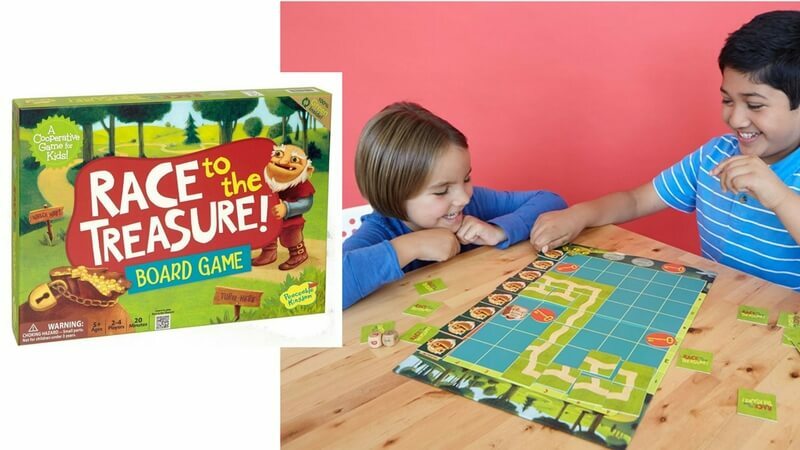 Children are instantly engaged with these games right out of the box as each comes with a 6‐foot long game board that you assemble like a puzzle. The object of the game is to make it to the end of the board before the pigs eat the picnic (Busytown) or Cinderella’s clock strikes midnight (World of Disney). The real magic happens when the spinner lands on “search” where you pick a card and work as a team to find as many of the item illustrated on the card as possible – all while racing against a timer. Kids will happily play several games of these at a time, and we even found that when they were done with the “rules”, they enjoyed just using the cards and performing the search for the fun of it. Stock up now before the next rainy or snowy day arrives! Pair a fun rotating power drill with colorful screws and fun designs, and you’ve got a toy with massive play power. 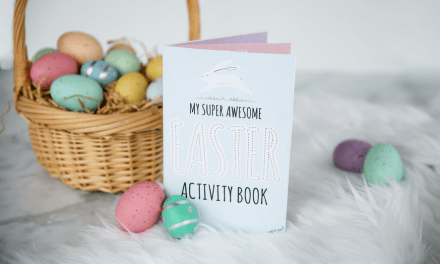 Kids can follow the designs on the included Activity Cards, or make their own, using the drill (with 3 drill bits), screwdriver or wrench to secure the pieces on the board. 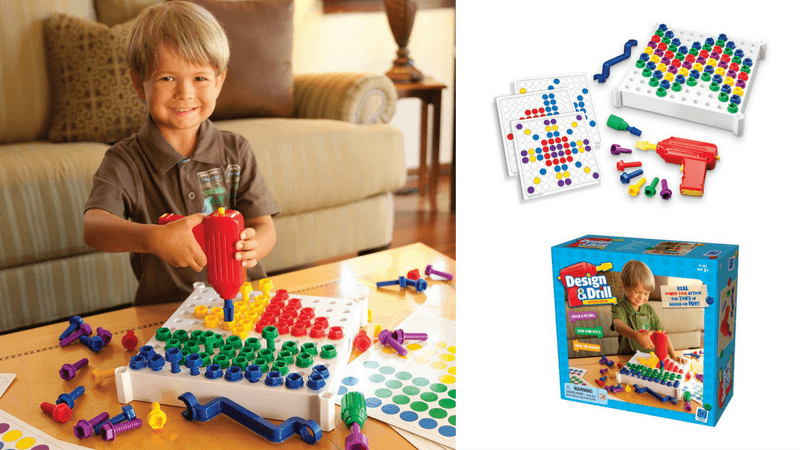 The Design and Drill is great for building hand‐eye coordination, pattern recognition and creative design skills. Kids love this one! The B. Critter Clinic portable pet hospital was one of our highest rated toys in all of our testing! We guarantee it will get tons of play time, and will be used in the most creative of ways. 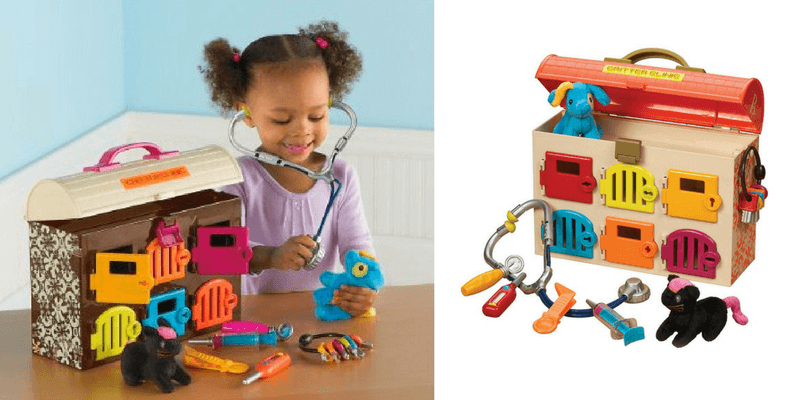 It comes with a full doctor’s kit (stethoscope, mirror, syringe, tweezers and thermometer) that tucks away under the rooftop compartment, plus two small stuffed animals (cat and a dog) and we love that the 6 colored doors can only be opened with the matching colored key. We stumbled over the dolls from La Loba Studio on Etsy, and holy moly are they amazing. 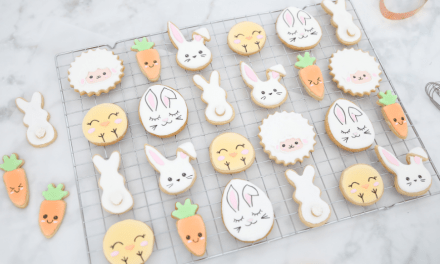 They’re handmade in Hungary and are just about the sweetest things we’ve ever seen. The superhero styles are our favorite, with removable cape, skirt or shorts, and mask. You can even add a personalized name patch or customize your entire order to make it look just like your child. This is a super special gift and one that will be kept and passed down for years to come. After a long search for something that compares to our beloved old Fisher Price “Little People” caravan from yester‐year, we finally found it! Take a look as this incredible wooden retro Camper Van from UK company, Indigo Jamm! 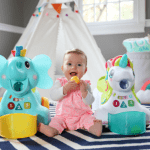 The family of peg people fit snugly inside (the roof comes off for easy access), and have color‐coordinating seats to help boost your little one’s matching and color recognition skills. And bonus – all of Indigo Jamm’s toys are made from a sustainable rubberwood that is durable and safe. 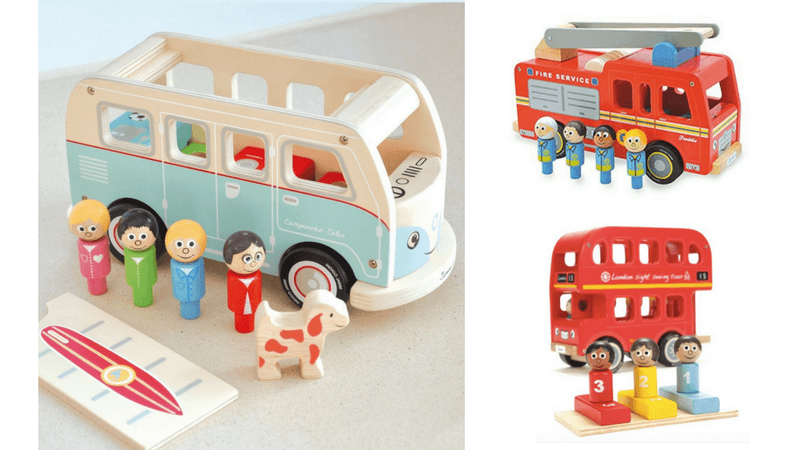 We are also majorly crushing on the Indigo Jamm Freddie Fire Engine which comes with 4 firefighters who can ride either inside the truck or on the ladder. And Bernie’s Number Bus where the peg passengers can be seated by number and color inside this awesome London Double Decker! 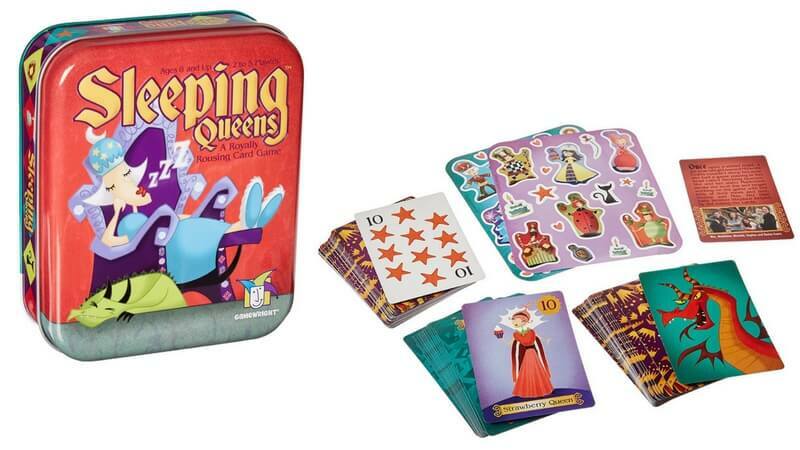 We think Sleeping Queens takes the crown when it comes to family‐style card games – it’s a great mix of fun characters, strategy, memory and math skills, all rolled into one dysfunctional kingdom. We will say that the game can feel a little daunting at first – there are quite a lot of rules that pertain to how the cards can be played and trump one another, but our advice is to just start playing, and keep the instructions handy to reference as you encounter the different cards. After a round or two, everyone will be hooked! 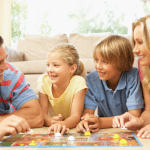 It’s a fantastic game for parents and kids to play together – our kids beat us more times than not, and all the rules and strategy keep it fresh for all. We recommend this 10th anniversary edition – it comes in a great storage tin and includes 4 new queens and 4 new kings from the original version, including the Strawberry Queen who can’t be stolen or put back to sleep! PS – if you already own Sleeping Queens, you’ll also love Sushi Go (8+; 2–5 players), a similar style card game with layers of complexity and beautifully design cards. If you don’t have the space for our recommended full‐sized bunk beds, opt for this lovely soft Corolle Carry Bed. 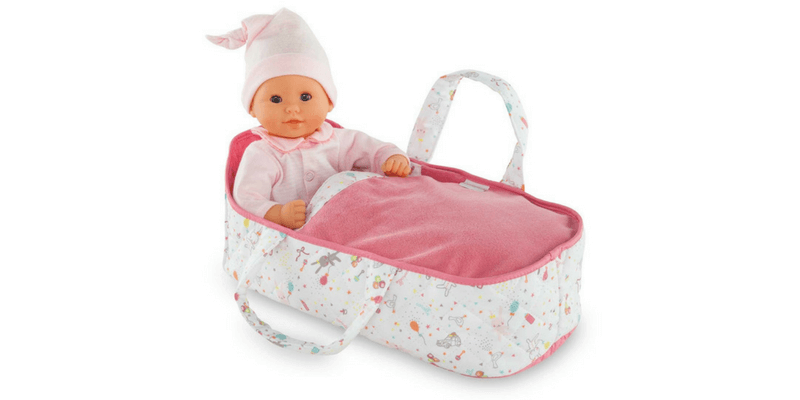 It can be folded up and squished into storage bins, and will fit dolls up to 18” inside the cozy pouch. Kids love to zip them in and carry them around by the handles. 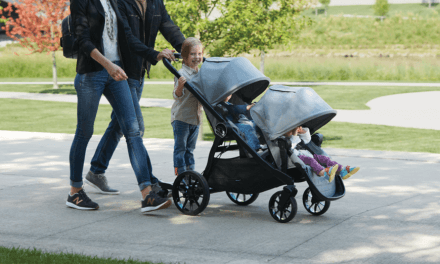 And bonus – our kids figured out that the handles can be worn over their arms so the baby is carried backpack style from one play area to the next! A must‐have accessory and perfect for those kids always on‐the‐go. Whether you consider it a stuffed animal or a doll, these stunning hand‐knit creations were instant favorites with every child who got a chance to “meet” them. 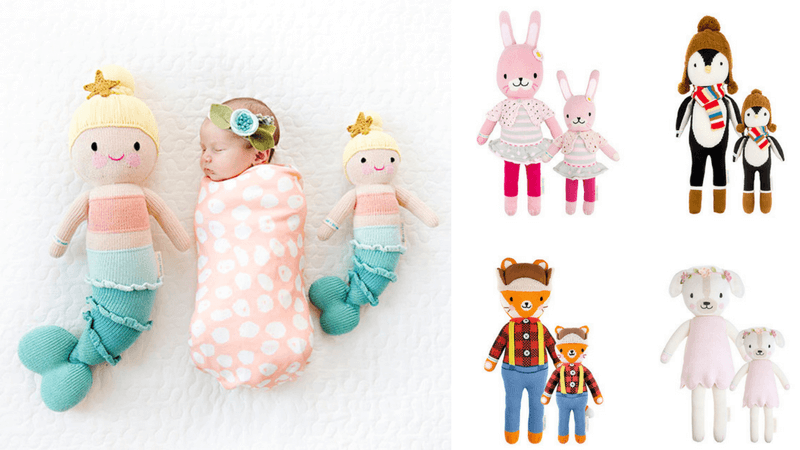 Each cuddle+kind doll is made by hand by artisans in Peru who are provided with a fair trade income, and are made with non‐toxic, high‐quality cotton – so they are as safe as they are cuddly. And to top it all off, for each cuddle+kind doll sold, this amazing company gives 10 meals to children in need. 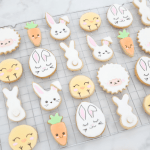 So scoop up a Chloe the Bunny or Aspen the penguin and you’ll not only be giving an heirloom quality gift, but you’ll be helping in the fight against hunger – a worthy cause indeed. If you’re looking for the perfect dollhouse for your 3–6 year old, look no further. The Chelsea Doll House from KidKraft isn’t an Amazon best seller by accident – it’s the high‐quality construction (which warning: you do have to spend about an hour assembling), 3‐levels, working open/close shutters, 17 pieces of wooden furniture, and 2 staircases that really propel it to the top. Plus, it’s one of the few full‐sized wooden dollhouses that isn’t a huge monstrosity: at under 3 ft. it’s the perfect size for a 4‐year old to sit and play. Cooperative games are fantastic for sibling play. Instead of battling against each other and ending up with a win/lose situation, they can work together towards the same goal. No more pouty faces, no more contention – just pure teamwork and fun. Peaceable Kingdom has an unbeatable selection of top‐notch cooperative games, and we’ve tested almost all of them to bring you our top 2 picks. The first, is Hoot Owl Hoot (4+ years; 2–4 players) where players race to return all the owls to their nest before the sun rises. We love that you can adjust the level of difficulty by choosing how many owls you play with, and that there’s real strategy involved. The kids we had playing this game ranged from 4 to 7 and they all collaborated together to work out what was the best move for each player based on the positioning of the owls and the upcoming cards, and when they weren’t successful, they were determined to play again to achieve their goal. 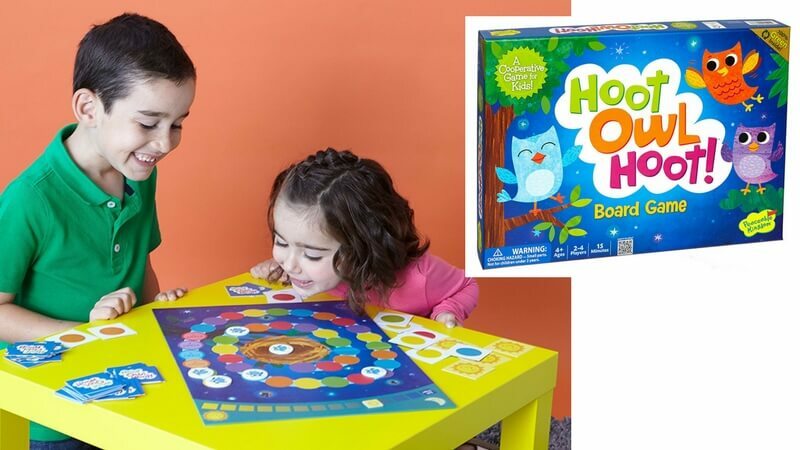 Hoot Owl Hoot is also a fun one for parents to play as there is higher‐level thinking that can be applied, and therefore it’s not a total snore! Next, is Race to the Treasure (5+ years; 2–4 players), which pits the players in a race against an Ogre to be the first to reach the treasure chest. Kids use the path tiles to create a road from start to finish, collecting keys along the way. There is definite strategy in how to place the pathways which sparked great discussions amongst the different groups of kids we had testing this game. And something about beating the Ogre seemed to ignite a real sense of “let’s do this” camaraderie amongst them that was simply delightful to watch. 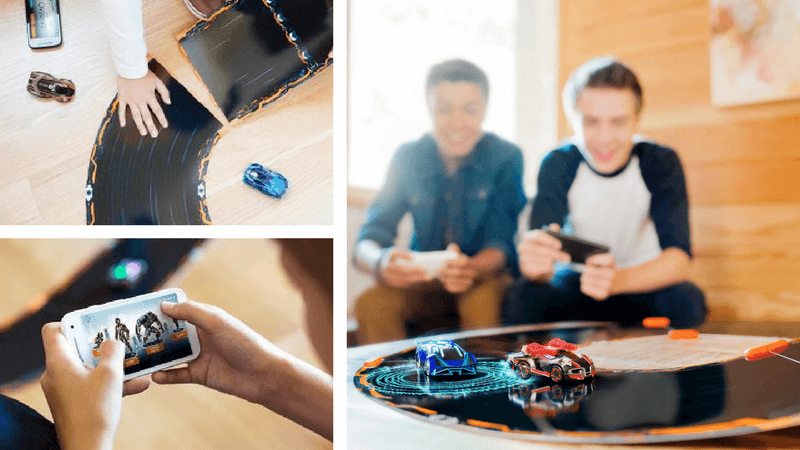 If you want to truly wow your kids on Christmas day, this Anki Overdrive next‐generation race track kit is a sure thing. Think of your typical slot‐race track amped up with a powerful computer/virtual reality component – so while you’re racing physical cars on a race track in front of you, you’re controlling their moves (speed, weapons, stunts, etc) via a tablet or phone. Now you’d think the set‐up for a “toy” this complex would be, well, complex. But thankfully it’s just the opposite – in just a few minutes, you can create your track (there’s 8 different layouts to choose from and pieces are magnetized for easy assembly), download the app (free for iOS and Android) and be off to the races. The app amazingly senses the cars on the track and brings them to the start line! You can choose if you race against a computer‐simulated opponent (which come in various levels so kids of all ages can be challenged…or not!) or a friend (just note that each person requires a device to control their car). There are also different modes of play including time trial, king of the hill and race against an opponent – so plenty of variation to keep it fresh for easy‐to‐bore tweens and teens. One feature that our kid testers loved was that as you complete more races you collect awards which allows you to customize your car with “weapons” that will allow you to penalize other cars during a race – you use the weapon via the app and you’ll see your opponent’s car slow down…so neat! 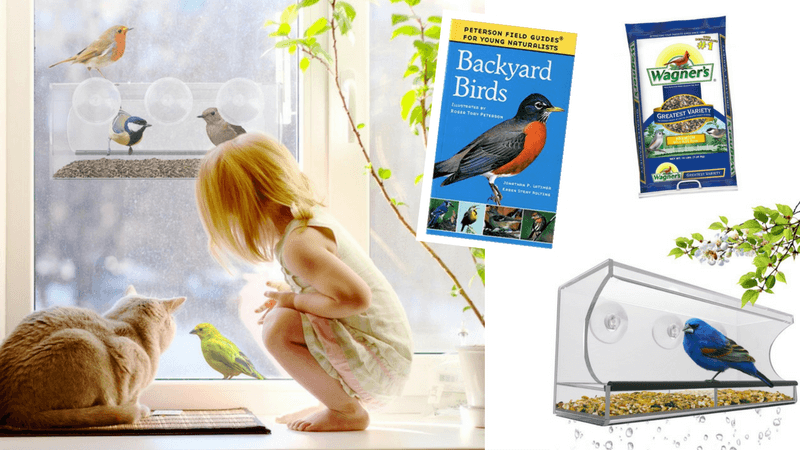 A bird feeder makes an awesome gift for any nature lover, and having it located near a window for prime viewing is a must‐have to really entice your kids. And that’s never been easier than with this 5‐star rated Window Bird Feeder from Nature’s Hangout. Made of heavy‐duty clear acrylic, you can easily suction it to the outside of any window, so birds are just inches away and easy to watch and identify. It holds 2 cups of bird seed, has drain holes to keep the seed from staying wet, and bonus – squirrels don’t stand a chance climbing glass! Gift this modern‐day feeder with a bag of seed and an introductory guide to Bird Watching. You will be amazed at the fun a child can have with their own camera. They love turning the tables and being the one taking the photos, instead of the one being told to “smile”. 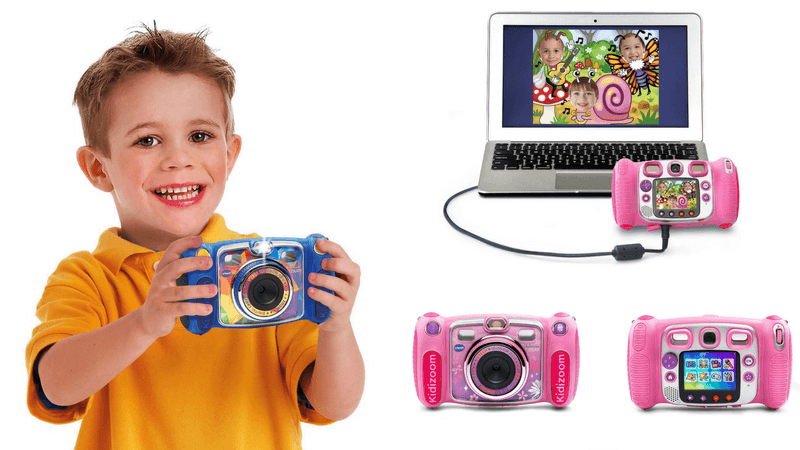 For kids as young as 3, we think the VTech Kidizoom DUO functions far beyond a toy camera. It features a 2.4” color screen and 256MB of memory (which can be expanded with a microSD card) to store their pics. There’s front and rear facing cameras, so kids can easily take those lovable selfies. You can even record video or voices (with fun voice changing effects!) and add frames, stamps and silly stickers to photos. It also includes 5 built‐in motion control games which we could do without, but luckily there are parental controls to limit their play time, or disable them all together. We’ve seen kids as old as 12 playing with this camera and having a ball! Remember how much fun you had when you got ahold of your parent’s Polaroid camera when you were a kid? Well despite the onslaught of digital cameras, there’s still something to be said for instant gratification. 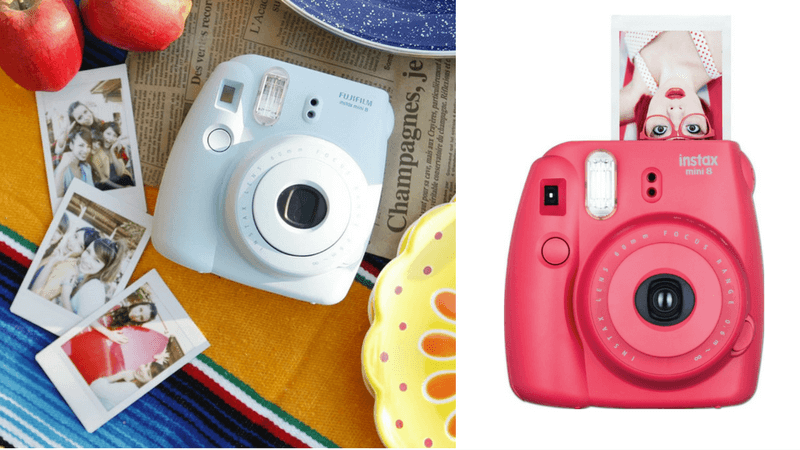 And your kids will agree, seeing the physical photo seconds after it’s taken never gets old, and they’ll just adore the vintage styling and fun colors of the Fujifilm Instax Mini 9. It’s a perfect gift for those hard‐to‐please tweens and teens. This incredible, award‐winning game system has us totally giddy because it is revolutionizing the way kids can use their iPads (and the kids we had test it out, ranging from 4–12, went nuts for it!). Instead of just being disconnected‐spectator‐zombies in front of an iPad, the Osmo system turns them into engaged participants who are thinking, learning and using their imagination with dynamic hands‐on play. Can we get a heck yea?! The set‐up is simple: just download the app, place an iPad in the base, and clip on the reflector. 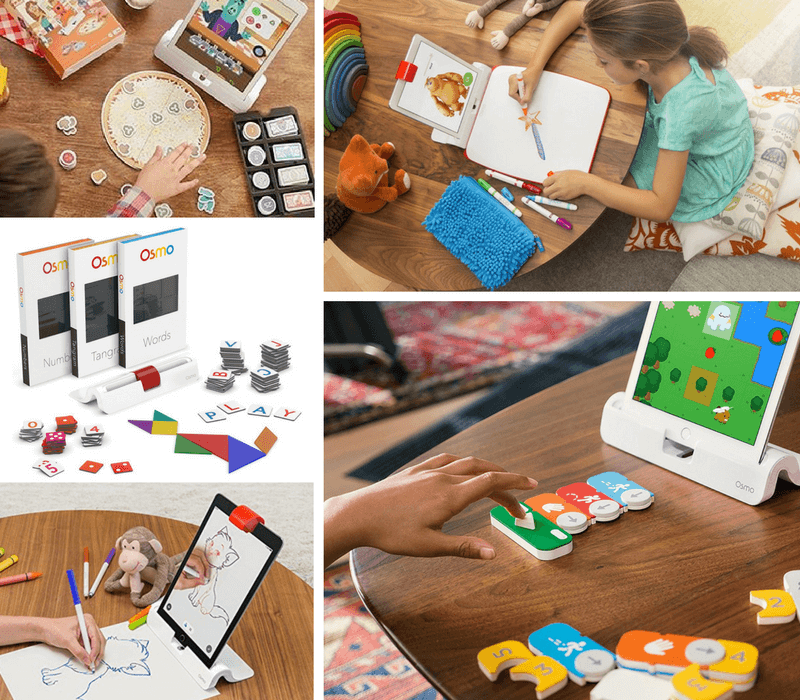 Then your kids are ready to use the Osmo game pieces or drawing board to start interacting with the screen. We have no idea how it “reads” these pieces, but it pretty much blew away every child we introduced to it (many of which have had years playing video games, so they weren’t new to the concept of cool stuff happening on a screen). Kids can learn to Code (yes, Code!) with the help of a cute strawberry‐loving monster, practice their Spelling and Math, unleash their creativity and have their drawings magically come to life, and run a Pizza parlor working with money, fractions and profit. Pretty dang amazing, right?! After the response we got from our testers, it’s one of our new favorite presents to give for the Holidays and birthdays, and we know your kids will love it too. 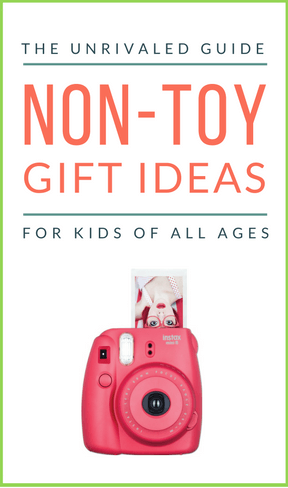 OK gang, this is one of our go‐to gifts for any child. 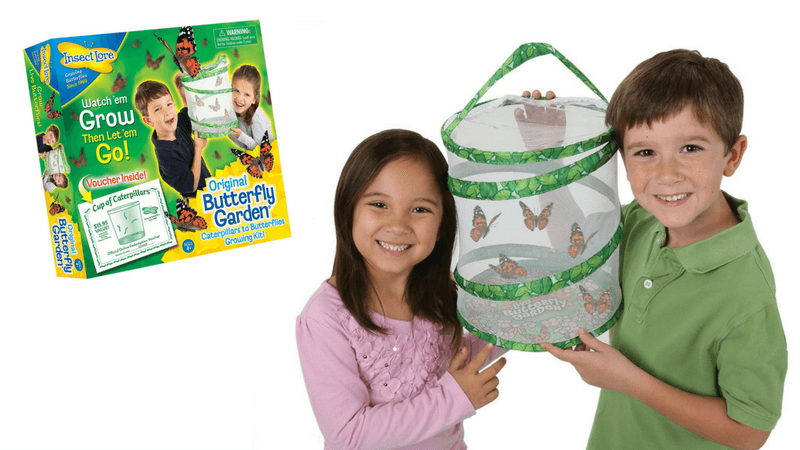 With The Original Butterfly Garden from InsectLore they can raise and feed caterpillars, watch them transform into chrysalides, and then emerge as stunning Painted Lady Butterflies! A super engaging 3‐week “experiment” that gives kids a front row seat to understanding the cycle of life. Add on a few kitchen tools and accessories to your cookbook gift, like these incredible knives which allow kids to cut through fruit and veggies, but won’t cut through their skin! 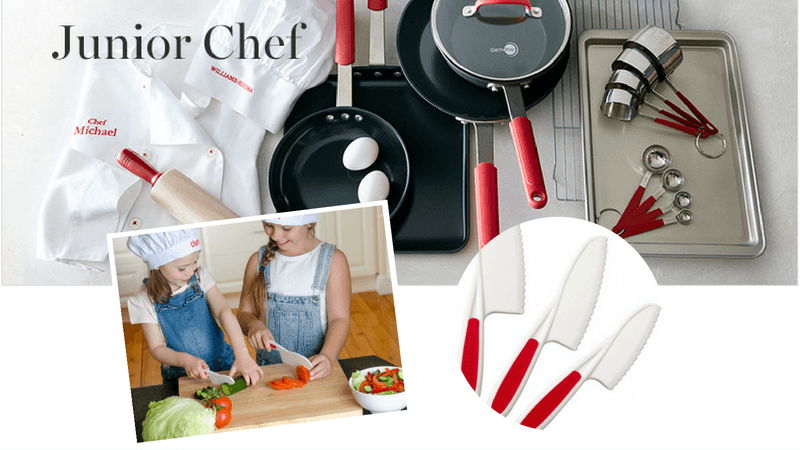 For older kids ready to step‐up their cooking to the next level, take a peek at the Junior Chef line from Williams Sonoma which offers top‐quality tools sized just for them. 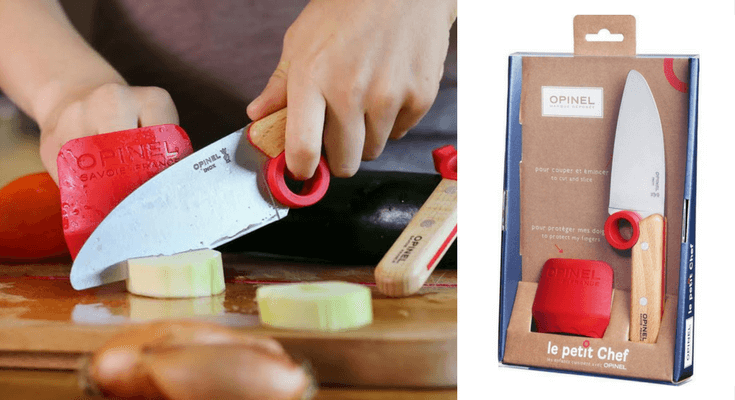 We also love the genius Opinel Le Petit Chef Knife & Fingers Guard set which keeps your child’s fingers out of harm’s way. The finger hole on the knife’s wooden handle not only teaches them the proper hand placement, but also positions their fingers to prevent them slipping onto the blade. 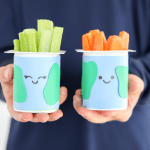 The accompanying finger guard allows them to safely hold the food without the worry of them cutting themselves. The stainless steel blade has a rounded tip, but is sharp enough to cut through hard vegetables like carrots and potatoes. If you want to teach good knife skills and worry less about your child helping in the kitchen, this is the gift you’ve been looking for! OK, you have to see these incredible bookmarks from My Bookmark. 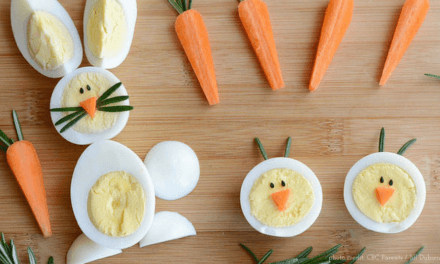 They are so creative and your kids will actually think they are cool. Really, we’ve even tested it. 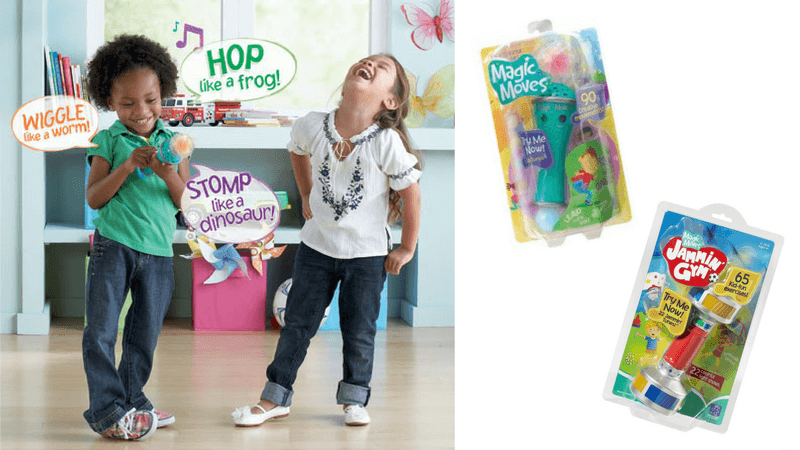 Pick from the huge selection including legs from the Wicked Witch, elf shoes, a mermaid’s tail and C3PO – there is sure to be a character or theme that will connect with your child. 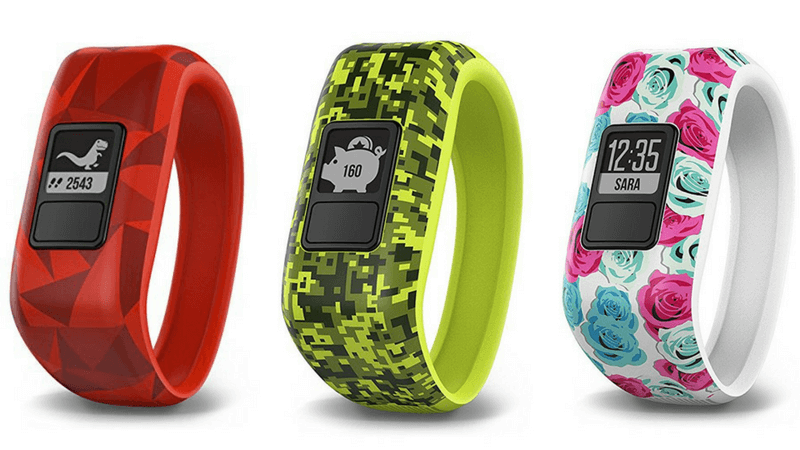 We give our highest recommendation to the incredible Garmin Vivofit Jr – a wearable activity tracker watch for kids age 4–9. 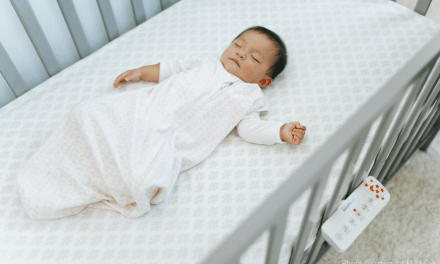 This neat device keeps track of your child’s steps, sleep and percentage towards their 60 minutes of daily activity goal. Its 1‐piece stretchy band makes for a comfy fit, it’s water/swim friendly and does not need recharging (battery will last about a year). It also includes a timer feature which your child can easily set on the watch themselves – we found this useful for daily activities like brushing teeth, waiting turns, doing homework and daily reading. 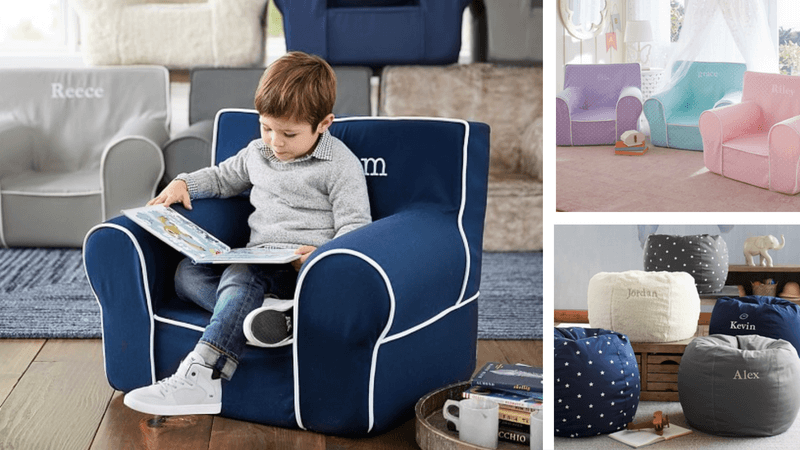 Give your child a comfy place to rest, relax or read in their very own, perfectly proportioned chair. Our kids all have the Anywhere Chair from Pottery Barn Kids, and they get used every day. They are incredibly light‐weight so can be moved anywhere (hence the name) they want – into a book nook for reading, in front of the TV for movie night, or turned over and made into a fun “slide” (editor’s note: my kids put theirs together upside down and make super fun obstacle courses!). 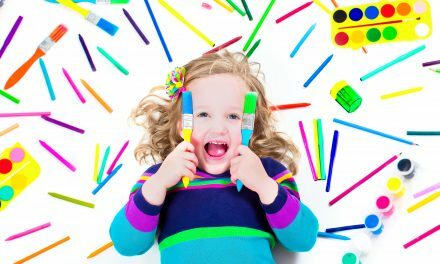 They come in a rainbow of colors, patterns, and materials, and can even be personalized with a child’s name. This is a wonderful gift for babies (who will grow into them), toddlers, and grade‐schoolers. 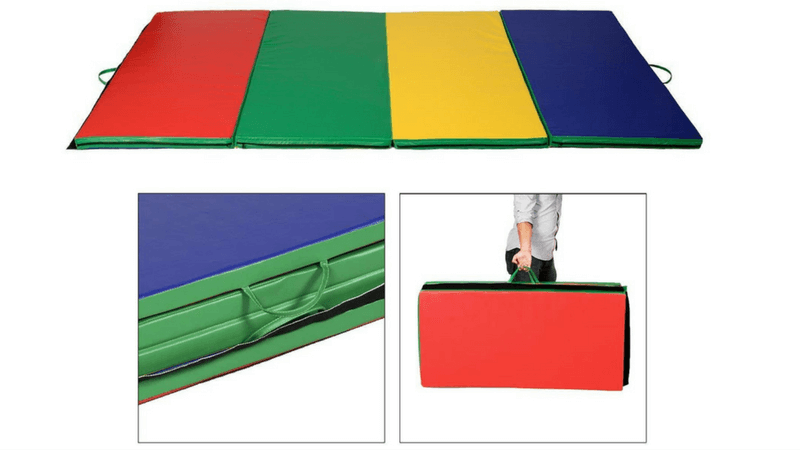 For an older child, try one of their equally awesome Anywhere Bean Bags. 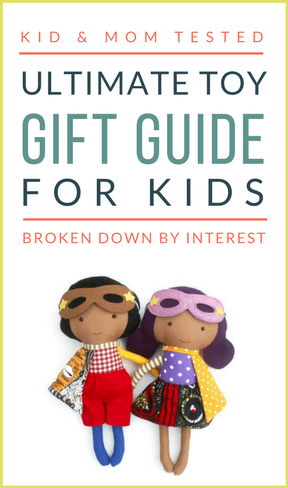 This is a great gift for teaching children the value of money, and how to budget and save. 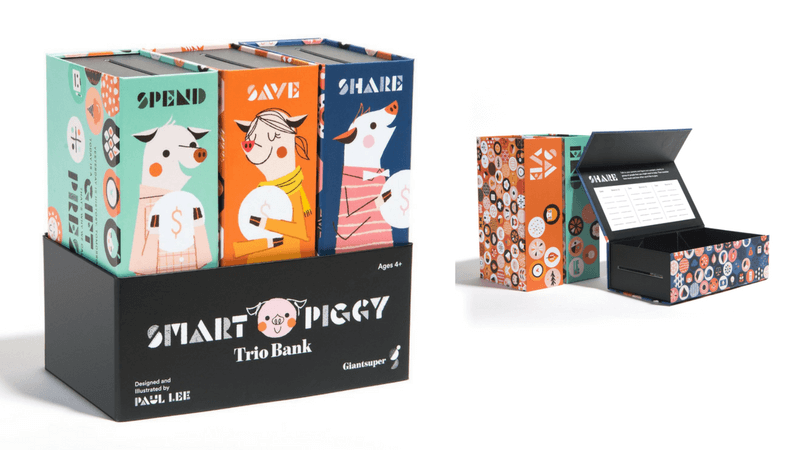 We’re currently obsessed with this Smart Piggy Trio Bank, which is just that – smart! There’s one “book” for spending, one for saving and another for sharing. They’re all super sturdy and easy to open so kids can keep track of how much they’ve collected. And you could even include a little (or a lot!) of pocket change in each one to start them off. The overall concept really encourages them to think about others, and not just that expensive Lego set they have their eyes on. It even comes with a Kid’s Guide that introduces the basic money concepts. This should be a must‐have on your child’s birthday or holiday list! 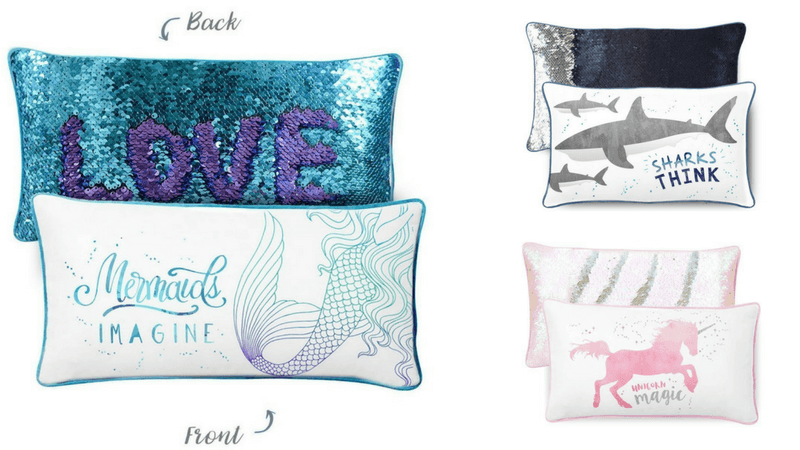 Alternatively, grab one of these incredible reversible sequin pillows from the Mermaid Pillow Co. Kids go absolutely nuts over these! Simply run your hand or finger over the sequins and they flip to reveal another color – allowing kids to make cool designs, write words or simply change the color to fit their mood. These ones are high quality (and actually include the pillow insert) and come in a multitude of designs like Unicorn, Shark, Dinosaur and of course, Mermaid. And bonus: kids reported that they found playing with the sequins to be quite calming. Use it with them before bed to wind down, practice spelling letters, their name or sight words…trust us, you won’t be able to keep your hands off it either! KiwiCo’s mission is to make STEAM accessible, engaging and fun – inspiring kids to see themselves as scientists, artists, creators and makers. 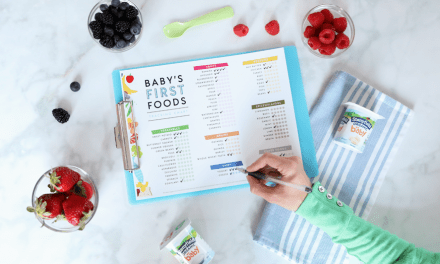 They offer 5 different subscription boxes based on your child’s age and stage – they are all extremely high‐quality, beautifully designed and thoughtfully crafted to stimulate your child’s passions. We had our Kiwi Crate tester’s creating incredible pin‐ball machines that they built themselves with the provided materials and played with for hours. They couldn’t wait to get their hands on the next month’s box. If we could give it more than 2 thumbs up, we wouldn’t hesitate! 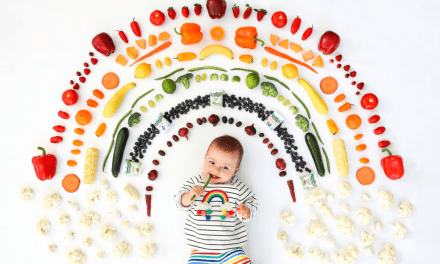 Cricket Crate (0–36 months) encourages the development and creativity of your baby or toddler. 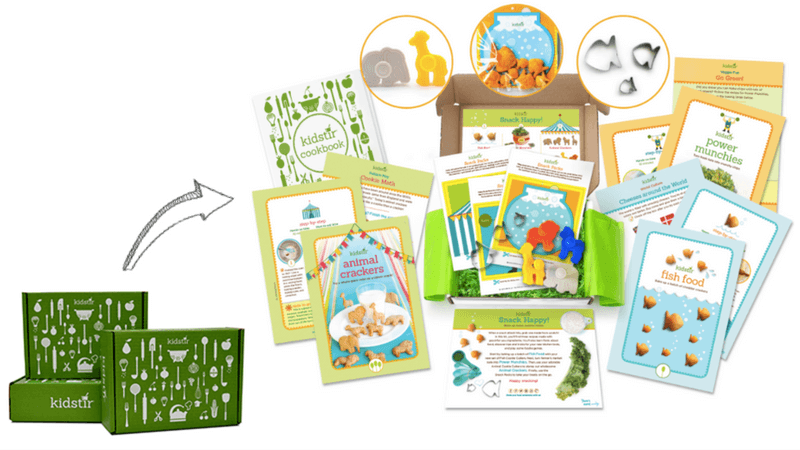 Monthly boxes include an age‐appropriate product (toy/activity), board book, magazine and parenting toolkit. Koala Crate (3–4 years) encourages play based learning and includes all the materials and inspiration for projects related to a theme such as music, garden or cityscapes. Kiwi Crate (5–8 years) includes science activities, arts and crafts, imaginative play and more. Monthly crates include everything you need for projects related to a theme such as science of color, lemonade stand and treasure hunt. 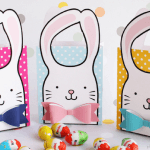 Doodle Crate (9–16+ years) is perfect for those older kids who love to create, craft and design. They’ll receive fun crafting materials and learn cool techniques like solar imaging, embroidery and woodworking. 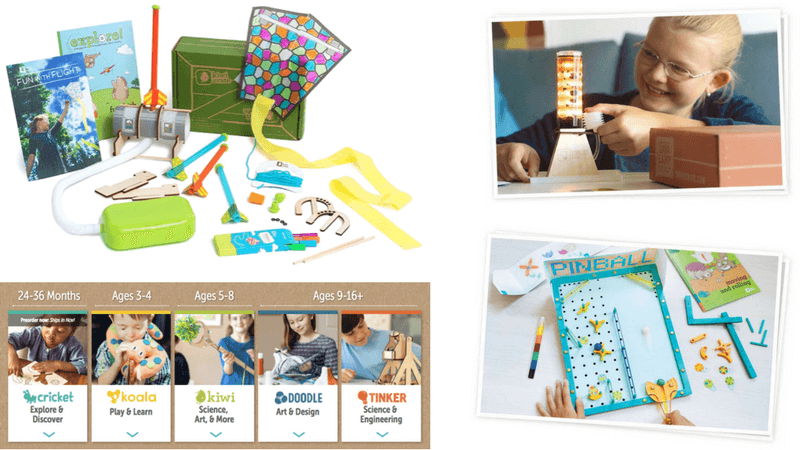 Tinker Crate (9–16+ years) aims to teach STEM principles to help kids solve problems and build critical thinking skills. Each month’s crate comes packed with materials and instructions to create incredible science and engineering projects. KiwiCo is very flexible and allows you to switch which crate your child receives at any time. Subscriptions are available on a month‐to‐month, 3‐month, 6‐month or 12‐month basis. SPECIAL OFFER: Right now Kiwi Co is offering $15 off on any 3+ month subscription. Use this link and promo code: CHEER15. Alternatively, get 30% off your 1st month’s box with this link and code: SHARE30. 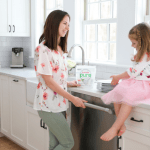 Kid Stir subscriptions are available in monthly, 3‐month, 6‐month and 12‐month plans. A small selection of single kits are also available for purchase. SPECIAL OFFER: Use this link and code HOLIDAY50 to get up to 50% off your first Kidstir kit. New subscribers also receive 2 bonus years of FamilyFun, Parents or EveryDay with Rachael Ray Magazine. 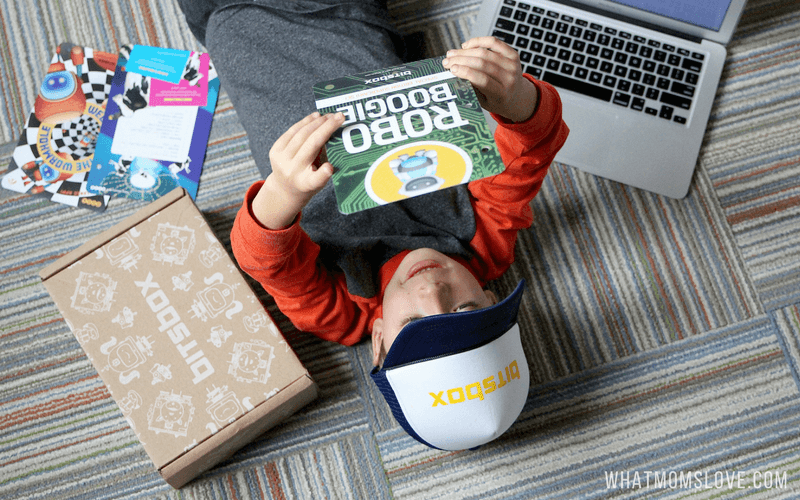 Give your kids a head‐start in this increasingly digital world with a subscription to Bitsbox where they will learn the language of the future: coding. Bitsbox teaches kids to code their very own apps by copying real code and then tweaking it to make it their own. With each box they receive beautifully designed coding cards (and a sturdy binder to keep them safe) that build on their developing skills and inspire them to create cool programs like birthday cards, robot destroyers and dancing animals. Kids simply pick a card, enter the project number into the Bitsbox website, and type in the provided code – they can then change the code to customize the apps (and learn all about different functions as a result). Once they’ve completed an app, they can share it to any mobile device – great for getting younger siblings involved, or simply making mama proud. 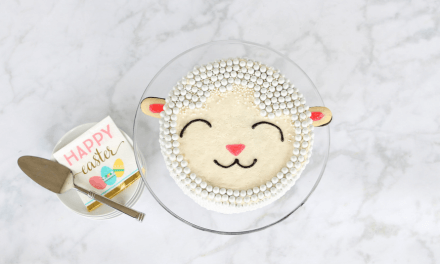 SPECIAL OFFER: Use code MOMS20 for 20% off any Bitsbox subscription! 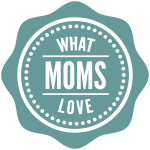 And before you go, if you’re not already a part of our What Moms Love community we’d love to have you on board. 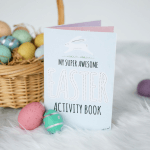 We’ll hook you up with all of our exclusive resources including our popular 10 Screen‐Free Toys For Guaranteed Quiet Time (this is seriously a game changer…and all of them also make great gifts! ), Holiday/Birthday Coupon Book for Kids and 35 Food Subs & Swaps for Healthy Family Meals. Just let us know where to send all your goodies!